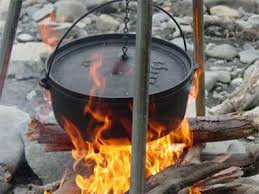 A Dutch Oven can cook almost anything you can cook in your kitchen oven.! Traditionally made of cast iron and sits on three legs to keep it above the coals. 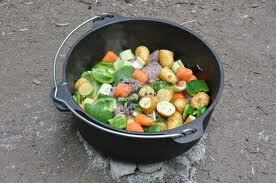 Dutch Oven Cooking is an easy way to cook just about anything for your totally off the grid! You don't need anything fancy to get started nor a lot of money. Part of being a Prepper is having alternative means of doing things. As far as cooking goes, Dutch Oven cooking can be your alternative means for making food for your family should there be no normal means to do so. A Dutch Oven can cook almost anything you can cook in your kitchen oven. 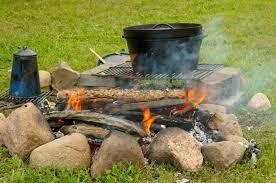 Traditionally Dutch Oven is made of cast iron and sits on three legs to keep it above the coals. The lid has a rim on it to keep hot coals in place and it has a steel handle to remove it from the heat. A 130cm pot is large enough for most meals you cook in a Dutch Oven and recipes can be easily adapted depending on what size your pot is. The popularity of the Dutch Oven was due to its versatility and that still holds true today. You can boil, bake, stew, fry, roast, etc in a Dutch Oven and then some. In addition to purchasing a Dutch Oven you may want accessories such as lid lifter, heavy-duty tongs, gloves, and a lid holder. None of those are essential, but make life easier. It's advisable to cook in an enclosed fire ring or similar structure to minimize the chance of the fire getting away from you. Start by getting your coals nice and hot and get your Dutch Oven in place. Once they are good and hot, place your ingredients inside and close the lid. 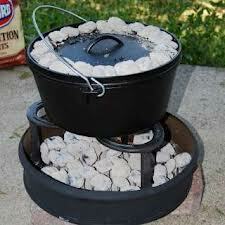 You want to place coals on the top and bottom of the Dutch Oven to get it to the right temperature. Aluminum Dutch ovens weigh about one-third less than their cast iron counterparts. They require no curing, and, like the cast iron pots, can be used over open fires, buried underground, or used with coals or briquettes. However, aluminum ovens do not retain heat as well nor distribute it as evenly as cast iron. The flavoring of foods produced will also be different. 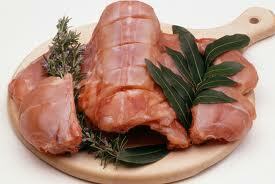 Aluminum ovens sometimes give a chalky flavor to foods, whereas iron ovens give a smoked flavor to foods. Dutch ovens range in size from 8 to 22 inches in diameter. The most commonly used are 10-inch, 12-inch, and 14-inch ovens. The larger ovens hold more if you're cooking for large groups, but they are huge, heavy, and hard to handle. 1. Only buy Dutch ovens with legs. Some are manufactured with flat bottoms and are far more difficult to use. 3. Check the casting, or thickness, of the metal, especially around the rim. Areas that are 15% (or more) thicker or thinner than the remaining areas will produce hot or cold spots during cooking and cooling. 1. You will need a pair of loose-fitting leather gloves long enough to cover your wrists. 2. Another tool you will need is a lid lifter. The most typical is a wire-handled hook. 3. Lid holders are also a necessity. This tool may be anything from a clean brick to a three- or four-legged wire rack. 4. Long-handled tongs are an invaluable addition to your Dutch oven tools. 5. A small shovel is also important. 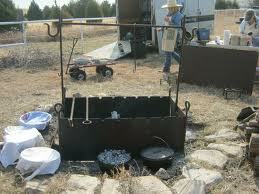 This is used for moving coals from a fire, digging a long-cook pit, or burying excess extinguished charcoal. 6. The last special tool you will want to consider is a whisk broom. The broom is used to brush the dirt, ashes, etc., off the lid and side of your oven in preparation for serving. You can prevent burned bottoms, raw tops, and dried-out foods by using properly sized and spaced coals to control the interior oven temperature. Virtually all baked goods can be baked successfully at 350°, which is the ideal temperature for a Dutch oven. To establish and maintain this temperature, the first thing to remember is to use coals from a fire that are roughly the same size as charcoal briquettes. Or, for more consistency, use briquettes. Charcoal briquettes will burn longer and more evenly than coals from a fire. Use the best briquettes you can afford. There is a difference in quality, and the more expensive brands are generally worth the additional cost. The number and placement of the coals on and under your oven is critical.The optimal number of coals used for any oven is based on its diameter. For example, if you are using a 12-inch oven, you will need two coals per inch, a total of 24. More coals will likely burn your food and less may necessitate too long a cooking period. To determine how many coals go under and how many go on top, remember the magic number 2. In the event that you need to generate a higher temperature inside your oven additional coals placed two at a time, one on the lid and one under the oven, will add another 50°. Two additional coals top and bottom would bring your oven's temperature up to 450°. It is extremely rare to need a temperature of 450°, and you should never need one higher than that. Good Dutch oven breads seem to be a rarity. However, marvelous corn breads, scones, rolls, and sourdough loaves are surprisingly easy to perfect in the old black pot. The larger the oven the better when it comes to cooking breads. A 14-inch oven serves nicely to produce three loaves of bread or up to three dozen rolls or biscuits. To successfully brown breads, however, you must alter the cooking process for the last five to eight minutes of the traditional 25-30 minute, 350° baking time. Dutch Oven cooking can be your alternative means for making food for your family should there be no normal means to do so. 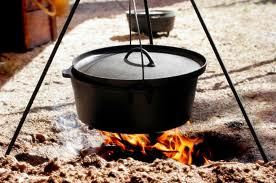 A Dutch Oven can cook almost anything you can cook in your kitchen oven.! 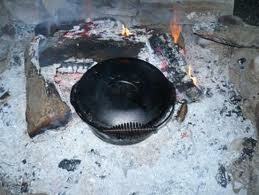 Traditionally Dutch Oven is made of cast iron and sits on three legs to keep it above the coals. 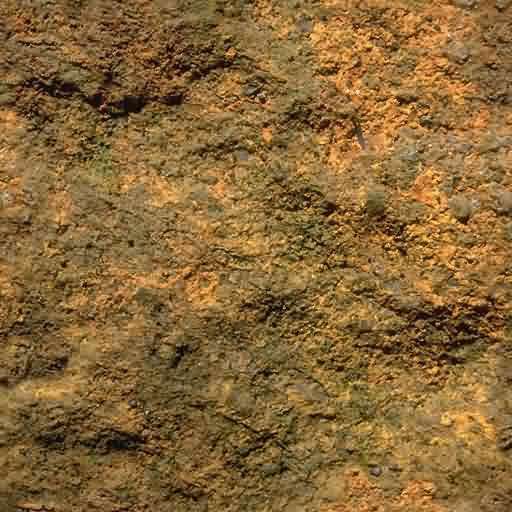 Cooking pots similar to today's Dutch Ovens have been in use since around the 7th century. 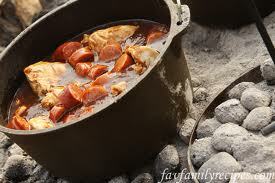 Dutch Oven Cooking is an easy way to cook just about anything for your totally off the grid! You don't need anything fancy to get started nor a lot of money.